We’d love your help. Let us know what’s wrong with this preview of The Devil Walks in Mattingly by Billy Coffey. It has been twenty years since Philip McBride's body was found along the riverbank in the dark woods known as Happy Hollow. His death was ruled a suicide. But three people have carried the truth ever For the three people tortured by their secret complicity in a young man's untimely death, redemption is what they most long for . . . and the last thing they expect to receive. To ask other readers questions about The Devil Walks in Mattingly, please sign up. I found myself still thinking about this book a few days after finishing it. When you get right down to it, this story was about love, repentance, forgiveness, and how secrets and guilt can slowly erode any happiness in life. The characterization in this book was outstanding. Every character had their own distinct personality and really seemed to come alive as I read the story - not just the MCs, but the supporting players also, and I think everyone can relate in some way to both Jake and Kate an I found myself still thinking about this book a few days after finishing it. When you get right down to it, this story was about love, repentance, forgiveness, and how secrets and guilt can slowly erode any happiness in life. The characterization in this book was outstanding. Every character had their own distinct personality and really seemed to come alive as I read the story - not just the MCs, but the supporting players also, and I think everyone can relate in some way to both Jake and Kate and their reasons for keeping secrets. The setting, a small town in the hollows of the Virginia mountains, was ideal. Going into the story, the reader knows something horrible happened in the past, and the truth is revealed, but very gradually. What is perceived as the truth by one may not be the same for all and discovering what it actually was kept me glued to these pages. This was a dark example of how our actions, regretful or not, can affect a multitude of lives for many years to come. At times, the writing was poetic, even profound, and I would reread some sections numerous times. I would recommend this book to readers that can appreciate a slower buildup in their books and the journey along the way, with a little supernatural kick thrown in. 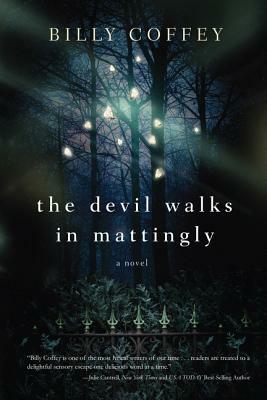 The Devil Walks in Mattingly is scheduled to be published March 11, 2014. This review is based on a digital copy provided by the publisher through NetGalley. Literate, compelling,poetic, deep: an examination of the stranglehold of guilt and the equally intense stranglehold of memory, A wrong deed happens in a moment, but guilt, fear, and memory endure for a lifetime. What can overcome: faith and grace; or a lifetime of Good Deeds? Jake Barnett is the sheriff in Mattingly, and his wife, Kate, does good deeds for the local poor. Both are racked with guilt because they feel responsible for the death of Phillip McBride twenty years earlier, back when they were in high school. As Jake and Kate attempt to cope with their guilt in their own ways, a variety of things are happening. Phillip is haunting Jake’s dreams. A mentally ill man named Taylor Hathcock is murdering and attempting to murder, with the conviction that life is a Jake Barnett is the sheriff in Mattingly, and his wife, Kate, does good deeds for the local poor. Both are racked with guilt because they feel responsible for the death of Phillip McBride twenty years earlier, back when they were in high school. As Jake and Kate attempt to cope with their guilt in their own ways, a variety of things are happening. Phillip is haunting Jake’s dreams. A mentally ill man named Taylor Hathcock is murdering and attempting to murder, with the conviction that life is a dream and he is benevolently waking people up. A young woman named Lisa, who reads philosophy and feels rejected, unloved, and sad about the death of her mother, becomes attracted to Taylor and begins to believe his rants. There is also a man named Justus, who shot at two people years before, and whom Jake and Kate do not want around their son, Zach. The book really came alive to me after page 200. Before that point, I had a hard time getting into it, but I diligently read on. I am glad that I stuck with the book and got to see how its mysteries were explained and resolved. The book is about forgiveness, moving on with life, insecurity, fear, reconciliation, and love. Some of its theological reflections resonated with me, while others did not. The book is rather deep and thought-provoking, though. My first introduction to Billy Coffey's fiction was his previous book, When Mockingbirds Sing, set in the same town of Mattingly, and even featuring a few of the same characters that appear in The Devil Walks in Mattingly. With Mockingbirds, I was engaged from page one and floored by its conclusion. Coffey made the mistake of writing too well; it meant that any of his future books would have to rival Mockingbirds in my opinion. Devil expands on the Southern, spiritual magic that pervaded Mattingl My first introduction to Billy Coffey's fiction was his previous book, When Mockingbirds Sing, set in the same town of Mattingly, and even featuring a few of the same characters that appear in The Devil Walks in Mattingly. Devil expands on the Southern, spiritual magic that pervaded Mattingly in Mockingbirds, but shines a more stunning light on the darkness all humans are capable of letting fester within their own hearts. I'd tell you about the plot, but that'd be ruining it. It's engaging, well-written, and has more than a few superb turns of spiritual phrases that part the veil between this world and the next. When it comes to fiction, I know a work is entrancing and fully fleshed out when I want to see it adapted for the big screen. Here's to hoping that some screenwriter, somewhere, at some point in the very near future starts reading Billy Coffey's books. Another fantastic book by Billy Coffey! Three characters all believe that they are responsible for taking another's life. The answers to the "who and how" questions are not fully revealed until near the end of the story, compelling you to continue reading. Since all of Coffey's books are set in Mattingly, there is always the chance of coming upon a favorite character from a previous book. These characters are always well developed and written in a way that makes it hard to leave them behind when Another fantastic book by Billy Coffey! Since all of Coffey's books are set in Mattingly, there is always the chance of coming upon a favorite character from a previous book. These characters are always well developed and written in a way that makes it hard to leave them behind when the story ends, and therefore, they are as comforting as a favorite old sweater when you chance to meet them again! It has been twenty years since Philip McBride's body was found along the riverbank in the dark woods known as Happy Hollow. His death was ruled a suicide. But three people have carried the truth ever since--Philip didn't kill himself that day. He was murdered. Billy Coffey's critically acclaimed books combine rural Southern charm with a vision far beyond the ordinary. He is a regular contributor to several publications, where he writes about faith and life. Billy lives with his wife and two children in Virginia's Blue Ridge Mountains. Visit him at www.billycoffey.com. Jake has been having odd dreams ever since the death of a good friend and he finds himself doing the most unspeakable things. He feels that his friend is trying to show him something through his dreams, but what? Soon appearances of odd things start to happen, it's doesn't take Jake long to realize that his friend's death has something to do with it. Kate does feel some remorse about what happened, but it seems her husband has taken a turn for the worst. She does the only thing she knows to do, help people. She begins trying to learn more of the new girl that moved into town. The girl seems to have something to hide but says nothing of it. Kate can't shake the feeling that something is wrong. Taylor finds mysterious footprints leading from Happy Hollow. He knows that there's something very odd about that because its footprints coming out not in, whatever made the footprints was already in Happy Hollow. Taylor must find out who came out of Happy Hollow before it's to late. Couldn't finish it. Life's too short to read bad books. First Sentence: I sat on the edge of Zach’s bed and stared at the small town of LEGOs and Matchbox cars that covered the floor. Mattingly is a very small town set in the mountains—old mountains filled with secrets--of Western Virginia. A boy died there 20 years ago. Although ruled a suicide, three people’s lives are still haunted by that death; the sheriff, his wife, and a hermit. Still, the events of the past also impact the life of a younger generation; Lucy Seekins. Can they find redemption at First Sentence: I sat on the edge of Zach’s bed and stared at the small town of LEGOs and Matchbox cars that covered the floor. Mattingly is a very small town set in the mountains—old mountains filled with secrets--of Western Virginia. A boy died there 20 years ago. Although ruled a suicide, three people’s lives are still haunted by that death; the sheriff, his wife, and a hermit. Still, the events of the past also impact the life of a younger generation; Lucy Seekins. Can they find redemption at last? There is a hint of the paranormal, which adds an intriguing element and would make for a fascinating topic of discussion as to what it is; what it represents, of what is real and what is not. In the midst of everything we, the readers, are trying to understand, comes a classic, ordinary plot twist. One can become taken with the imagery, yet still be reminded that there is a good, often suspenseful, story being told. At the same time, there is a strong spiritual theme and a reminder of the good that can come with simple beliefs—“Despite what Kate and Taylor and I always thought, it was choice rather than fate that governed our lives.” And who doesn’t love a book that includes a quote from poem “A Dream Within a Dream” by Edgar Allan Poe. “The Devil Walks in Mattingly” is a wonderful read with a bit of everything, spirituality, suspense, just a very small touch of the paranormal, the price of sins and pride but followed by redemption. As I finished the latest novel from Billy Coffey, The Devil Walks in Mattingly, I remember what he told me when I interviewed him on what the reader would find in this one. He told me it will be much darker. And it is. Much darker! To those of you that are looking for a happy story of some facet of Billy's walk in life, this is NOT that novel. Ir reminds me in fact of the opening line that Jude Law narrates for Lemony Snicket's A Series of Unfortunate Events, "Dear reader, there are people in the As I finished the latest novel from Billy Coffey, The Devil Walks in Mattingly, I remember what he told me when I interviewed him on what the reader would find in this one. He told me it will be much darker. And it is. Much darker! To those of you that are looking for a happy story of some facet of Billy's walk in life, this is NOT that novel. Ir reminds me in fact of the opening line that Jude Law narrates for Lemony Snicket's A Series of Unfortunate Events, "Dear reader, there are people in the world who know no misery and woe. And they take comfort in cheerful films about twittering birds and giggling elves. There are people who know that there's always a mystery to be solved. And they take comfort in researching and writing down any important evidence. But this story is not about such people.The movie you are about to see is extremely unpleasant. If you wish to see a film about a happy little elf, I'm sure there is still plenty of seating in theatre number two." This novel is actually the prequel to Billy's third novel, When Mockingbird Sings. I've been a huge fan of Billy's since the days I first came across his stories on his Blog, "What I Learned Today", and fell in love with his uncanny abililty to do more than just tell a great story. He makes it come alive and makes you part of the action. I wanted to run ahead and read The Devil Walks in Mattingly as fast as possible, because you will always come away changed after reading ANY of his books. This one was NO different, however much like a race horse yearning to run ahead at the start of the gun, this one held me back restrained. No matter how much I wanted to run ahead, this one made me go slow. To say this novel is deep and dark, is an understatement. I believe it's Billy's finest examples of just how versatile of a writer he truly is. I liken this novel to something a bit of a blend between Stephen King, Edgar Allen Poe and M. Night Shyalmalan's Sixth Sense. This is about what we all face when dealing with the guilt of sin in our lives. Especially in this case where the murder of a young boy, Phillip McBride that happened twenty years ago, is now being felt in the town of Mattingly, Virginia by those with guilty consciences, the local sheriff, Jake Barnett, his wife, Kate, and the recluse that lives in Happy Hollow, Taylor Hathcock. Each of them believes that they have had a hand in the murder of Phillip and each have found a coping method that is slowly unraveling at the seams. For Jake, he is trying to avoid confrontation at all costs in his job as Mattingly's sheriff, including the apprehension of his own father, Justus wanted for the murder of three men. Jake is haunted by nightmares of that fateful day by Phillip to deprives him not only of sleep but in moving forward in his life. Phillip is the spectre with a warning that he is coming back for him and Kate, and no one will escape. But is it really happening or it just the over active imagination of a guilty conscience? Kate is stuck making amends for her guilt, one I related to the most. She keeps a notebook of all the young people she has helped to atone for her sin. She is hoping one day, she will achieved enough good deeds to make up for the one she can't apologize for and for the innocent loss of life she claimed that day when her prank took an unexpected turn on the last day of high school. For Taylor, he spends his days waiting for just the right moment to "wake" them all up. He suffers from a mental snap and believes that the life his is living is merely a dream and that he is the only one who can help them all. He cautiously spies upon the sleepy residents of Mattingly knowing that the day is close at hand. The one event that brings things to life is the day footprints appear in the Hollow from a protective grove that Taylor is the keeper of, that lead back to Mattingly and back to her. Now he just needs to find the clues to piece it all together, but this will also bring to the town of Mattingly, an evil they have never experienced before and one that will forever change the town. One of my reading goals for this year is to branch out from my usual reading habits and try some new-to-me books and authors. In the sleepy town of Mattingly, Virginia, where nothing much out One of my reading goals for this year is to branch out from my usual reading habits and try some new-to-me books and authors. In the sleepy town of Mattingly, Virginia, where nothing much out of the ordinary happens, three of its residents go about their lives but are haunted by an event 20 years in the past. It was the day teenager Philip McBride died. His death was ruled a suicide but these three know the truth: he was killed. Jake Barnett carries shame for what happened that day and how he'll never be the man anyone else wants him to be. His wife, Kate, spends her days logging good deeds done for the poor and unfortunate of Mattingly, hoping it will outweigh the guilt she feels for her part in Philip's death. And Taylor Hathcock, a mountain recluse, believes in his madness the time has come to make it all right. Plagued by dreams and visions and events that don't make sense, the three are drawn together to reveal the truth that will surprise them all. And I can't say anymore because I'll give too much away! What I can say is that Coffey's writing is some of the best I've ever read. He creates deep character points-of-view using a blend of first- and third-person. It was like seeing inside their minds. And he crafts some of the most beautiful sentences I've had the pleasure of reading. He brings to the page the unique pace and wording of the Virginia dialect--philosophical, observational, straightforward, and down-to-earth. It can't be easy to create such believable prose. It was not limited to dialogue. The whole book was full of these gently rolling sentences full of truth. I come to this place of darkness because it is where the light of heaven once touched. I come here for the ones who were saved on a night long ago and for the ones lost. I come because heaven is not without the past. Even as I re-read the first pages, which are titled "The End," I noticed clues to the story I hadn't picked up on at first. The Devil Walks in Mattingly is layered, and I think reading it through once won't be enough. Twenty years ago, Philip McBride died in Happy Hollow. His death was ruled a suicide but was it just a tragic accident? Or was his death something far more sinister? In Billy Coffey's The Devil Walks in Mattingly, only one person knows the truth about what happened that day, but three people are tortured by their actions that may have led to Phillip's death. Neither the past nor secrets truly remain hidden and no one is more aware of that than the sheriff of Mattingly, Jake Barnett. He is slowly Twenty years ago, Philip McBride died in Happy Hollow. His death was ruled a suicide but was it just a tragic accident? Or was his death something far more sinister? In Billy Coffey's The Devil Walks in Mattingly, only one person knows the truth about what happened that day, but three people are tortured by their actions that may have led to Phillip's death. Neither the past nor secrets truly remain hidden and no one is more aware of that than the sheriff of Mattingly, Jake Barnett. He is slowly being crushed by the weight of the events from twenty years ago as night after night in his dreams, he relives that day over and over. His wife Kate desperately tries to make amends for her role through good works, but she can never fully escape from her guilt. Taylor Hathcock's grip on reality is forever altered and he sets in motion a devastating chain of events in the present that will eventually make all three of them face what happened on that long ago day. The Devil Walks in Mattingly is told from each of the key players points of view. Matt's character speaks in first person and his exhaustion, shame and despair are keenly felt throughout the novel. Kate's character always feels a little distant and removed since there is little context for her overwhelming need for penance. Taylor is the most confusing character because it is obvious that he is mentally unstable and there appears to be no rational reason for what he is seeking. The most compelling of all the characters is not a person, but a place. Commonly referred to as the holler by the locals, Happy Hollow is a place to be avoided but reaching the gate to the holler is a rite of passage for most of the men in Mattingly. The holler is alive with what feels like an evil presence and few dare to venture into the malevolent forest. But it is always clear the holler is key to the unfolding story: Philip died within the holler, Taylor now makes his home in the holler and Jake steers clear of the holler at all costs. But the holler is where supernatural forces will provide salvation and quite possibly redemption, for Taylor, Jake and Kate. The Devil Walks in Mattingly is not an action packed novel that moves at breakneck speed. It is a slow moving story that builds little by little to a rather impressive and dramatic conclusion that offers almost all of the answers that the readers and the characters have been searching for. But there is one intriguing secret of the holler that remains hidden but since Mattingly is also the setting of Billy Coffey's previous novels, I can only hope he plans to eventually reveal the truth in a future release. I became a fan of Billy Coffey's writing years ago, devouring his regular blog posts before he published his first book. Then came Snow Day, Paper Angels and When Mockingbirds Sing. I have savoured each novel, always looking forward to the next. "For the three people tortured by their secret complicity in a young man's untimely death, redemption is what they most long for . . . and the last I became a fan of Billy Coffey's writing years ago, devouring his regular blog posts before he published his first book. "For the three people tortured by their secret complicity in a young man's untimely death, redemption is what they most long for . . . and the last thing they expect to receive." As I writer, I read not only for content, but for the taste and feel of the words themselves. I was not disappointed, like his other works, from beginning to end, Billy's prose remains stunningly lyrical. "I come to this place of darkness because it is where the light of heaven once touched. I come here for the ones who were saved on a night long ago and for the ones lost. I come because heaven is not without the past." These are characters that dug their way into my heart, both heroes and antiheroes. My concern for each kept me turning page after page, hungry to discover what would happen next. I was moved in the darkness to each shining patch of light. My only complaint is that this novel deprived me of sleep and distracted me from my own work. Yes, it IS that good. There are times when I'll stick with something for no other reason than I like the idea of it. So it goes with The Devil Walks in Mattingly. Summarized neatly on the back cover it sounded quite good, but it ended up falling a bit short for me. The guilt-theme was absolutely beaten to death. By the end of the book I fully believed the entire town was certifiable or at least in need of some serious, long-term therapy. Sprinkled throughout there was a valiant attempt at suspense. The reader would e There are times when I'll stick with something for no other reason than I like the idea of it. So it goes with The Devil Walks in Mattingly. Summarized neatly on the back cover it sounded quite good, but it ended up falling a bit short for me. Sprinkled throughout there was a valiant attempt at suspense. The reader would eventually be treated to a 'big reveal' on certain topics, but after such a lengthy wait these revelations seemed annoying and sometimes unnecessary. The supernatural/sci-fi'ish theme was pretty much left until the very end. It was rushed, it was filled with holes and it left you with a lingering feeling of...meh. I don't read a lot of Christian Fiction, so maybe I'm missing something here. Perhaps this was an exceptional book considering the category? I have no idea. However, for someone who reads a wide range of genres this book couldn't hold it's own. It felt thin. Sort of stretched, like... butter scraped over too much bread. (sorry, but sometimes hobbits have a perfect way with words: http://youtu.be/1xSuigFN3oU ). Billy Coffey is an author I will read over and over. The Devil Walks In Mattingly happens four years before When Mockingbirds Sing, but you can read his books in any order. Each story stands alone. Jake Barnett, Kate Barnett, and Taylor Hathcock are the only ones who really know what happened to Phillip McBride. Was it a suicide like everyone thinks or did something more sinister happen? Jake, Kate, Taylor, and Phillip are forged together due to their pasts, but then something goes terribly wrong that follows them the rest of their days. Now their past is here to haunt them in the here and now. “We all had secrets we kept and lies we told, and often the greatest among them were the ones we kept from and told to ourselves.” Happy Hollow, the place where nightmares are born. The past, where anything was possible. The present, where the past comes back to set right the actions of the past. Redemption may never be found, but the end is coming. Some people run from their pasts; others live it in. But when the past comes at you, it’s time to face it head on. Like to read a suspenseful mystery thriller? This is the one book you have to read. Once you start it, you won’t dare put it down until you know the last detail of what happened twenty years ago. this was a good book from start to finish! it had so many twists and turns, that it left you wanting to read more! Not to mention, Billy Coffey's southern style of writing made the book very enchanting! Definitely a must read! I feel like I am the only person who didn't like this book. I thought it was too long. I don't want to spoil the ending, so I'll just say that I thought the path the author went down was not biblical regarding heaven, death, etc. Coffey's books are pure magic. It's a mystical wonderland of sensation and nostalgia combined with enough truth to make every book a sensory delight. He is one-of-a-kind in Christian fiction. It was ok. A husband and wife are harboring secrets that are getting in the way of their marriage, thinking they are protecting the other one. The ending was a little odd and did not really feel like it worked. This is one of those rare books that not only entertained me, but connected with me on so my levels! Jake and his wife, Kate, live under long-held regrets centering around one of their high school classmates, Phillip. Phillip's death 20 years ago was ruled a suicide, but Jake and Kate each believe they killed him. Jake is sheriff of the small mountain town of Mattingly, VA. He took the job because he's desperate for peace, not because he's strong like his father was. When violence rocks his town, Jake is out of his depth. Characters like Jake and Kate feel real yet a touch distant, as if we're pe Jake and his wife, Kate, live under long-held regrets centering around one of their high school classmates, Phillip. Phillip's death 20 years ago was ruled a suicide, but Jake and Kate each believe they killed him. Characters like Jake and Kate feel real yet a touch distant, as if we're peering into another world. Others like the hermit Taylor, are even more distant yet eerily believable. This separation may be due in part to the multiple points of view (each one expertly rendered) and to the switch from third person to first for Jake's viewpoint. It's probably a good thing, too, because it lets us read without being overwhelmed by the characters' pain. Billy Coffey's writing impressed me from the start. The novel has a haunting, lyrical feel, and I understand why one reviewer called the author a minstrel. This is not my type of story, but I found much to appreciate in its pages. It's deeper, introspective, literary. A slow read, not a race. The title says "horror" to me, but the devil in question is the sins of the townsfolk. It's eerie and supernatural, but definitely not the "screamfest" type of horror. The Devil Walks in Mattingly digs into those regrets we all hold, big or small, and reminds us that although we can never undo the past or earn a pardon, there is forgiveness and grace if we'll stop holding onto the past. You can learn about Billy Coffey and his writing on his website, and if you sign up for his newsletter you'll receive the opening chapters of The Devil Walks in Mattingly for free. You can read a shorter sample on the publisher's website. The Devil Walks in Mattingly takes place four years before one of Mr. Coffey's previous novels, When Mockingbirds Sing. The author writes a gripping, mysterious and veiled story that kept me reading and pondering for days. Before I began the book, I read the back cover which helps set the stage for what the contents are as well as learning in the Publishers Note that the events in this book happen four years before When Mockingbirds Sing. While each story written by Billy Coffey can be read in any order, I was glad to have known before starting When Mockingbirds Sing that in the tale’s timeframe these events came first. Soon I will read When Mockingbirds Sing, which I wanted to read because of the interest the title aroused in me as it reminded me of a classic book, To Kill A Mockingbird, which I read in high school. Please note the stories aren’t related. In The Devil Walks in Mattingly, there was a sense of discovery just waiting for me as I opened the book to begin. I wondered if the writing would be similar to Ted Dekker’s books which never cease to amaze me. Well, let me say I wasn’t disappointed in reading Billy Coffey’s book at all! It is uniquely written with a tale wrapped in mystery and an ending with a revelation that stays with the reader long after the book is closed. The Devil Walks in Mattingly stirs within the soul of the audience the belief in God’s grace, which can bring freedom to the soul or unbelief and attempts to bring about one’s own salvation. Craftily written within the fabric of the characters are the various ways man believes will rid him of guilt. As people read the book, they will be able to identify either with particular characters or traits or behaviors they exhibit. Totally a must read by this author! It wasn’t one I could easily fly through; it is a novel that took me time to read. I cannot wait to begin When Mockingbirds Sing as I am sure it is thought-provoking, engaging and has a spiritual truth embedded within as well. Billy Coffey in his new book “The Devil Walks In Mattingly” Book Two in the Mattingly series published by Thomas Nelson takes us back to the town of Mattingly. From the back cover: For the three people tortured by their secret complicity in a young man’s untimely death, redemption is what they most long for . . . and the last thing they expect to receive. It has been twenty years since Philip McBride’s body was found along the riverbank in the dark woods known as Happy Hollow. His death was ruled Billy Coffey in his new book “The Devil Walks In Mattingly” Book Two in the Mattingly series published by Thomas Nelson takes us back to the town of Mattingly. It has been twenty years since Philip McBride’s body was found along the riverbank in the dark woods known as Happy Hollow. His death was ruled a suicide. But three people have carried the truth ever since—Philip didn’t kill himself that day. He was murdered. Each of the three have wilted in the shadow of their sins. Jake Barnett is Mattingly’s sheriff, where he spends his days polishing the fragile shell of the man he pretends to be. His wife, Kate, has convinced herself the good she does for the poor will someday wash the blood from her hands. And high in the mountains, Taylor Hathcock lives in seclusion and fear, fueled by madness and hatred. Yet what cannot be laid to rest is bound to rise again. Philip McBride has haunted Jake’s dreams for weeks, warning that he is coming back for them all. When Taylor finds mysterious footprints leading from the Hollow, he believes his redemption has come. His actions will plunge the quiet town of Mattingly into darkness. These three will be drawn together for a final confrontation between life and death . . . between truth and lies. Twenty years ago Philip McBride committed suicide. However that is not true he was actually murdered and three individuals have kept that a secret. The problem is there is a certain weight that go with the carrying of this kind of secret and, after twenty years, it is beginning to crush them. All three of them are trying to repent of their sin by their works and that is never going to accomplish anything. The only one who can forgive sin is God and it is going to take their repentance and His forgiveness to restore these three persons back to health. That is if they survive that long. Mr. Coffey does a superb job of making each character come alive so that we feel what they feel. This is a gripping story that will keep you flipping pages late into the night until you finish it. I recommend this book highly and look forward to a return to Mattingly. Do you remember the time you picked up a book by an author that you hadn’t read? The queasiness and unease that you felt? Should you spend the money on the unknown author, or pick up the book by an author that you already know that you’ll enjoy the book? Those were the feelings that I had after I requested this book. Come with me and let’s peel the cover back together and find out if I made the right choice or not. Three lives forever changed by the death of one young man. Three lives searching f Do you remember the time you picked up a book by an author that you hadn’t read? The queasiness and unease that you felt? Should you spend the money on the unknown author, or pick up the book by an author that you already know that you’ll enjoy the book? Those were the feelings that I had after I requested this book. Come with me and let’s peel the cover back together and find out if I made the right choice or not. Three lives forever changed by the death of one young man. Three lives searching for redemption but not expecting it to ever be extended to them. As they all struggle with the guilt that comes from this single event, things begin to take on a strange life of their own. Jake know what was happening but did nothing, his wife, Kate, shares his guilt over what has happened and Taylor is starting to come apart. As super-natural occurrences continue in Happy Hollow, the three of them have increasingly hard times figuring truth from fiction. Did one of them really kill Phillip? Will forgiveness be extended to any of them, do them even deserve it? Is the happenings real or is it just their guilt manifesting itself into reality? Don’t keep your head up in the holler, go BUY THIS BOOK!! I will admit that this book was tough to get into and tough to follow. The writing style of the author is more poetic and rhythmic than I’m normally used to reading. The characters and descriptions provided are very detailed and specific. This tends to bog down my enjoyment as sometimes I think authors can provide too much information as they are establishing their story. The plot of “Thin Places” is a new one to me, so this book was interesting and not something that I have read before, so from that aspect this was new and kept me coming back for more. The mystery and supernatural elements are pretty obvious, but the Christian element is left in the background. Is this a "guy's book"? This book does not provide you with all of the normal mind-blowing, car-chasing suspense novels that I normally review on here. This is more of an allegory, but one that tells a great story if you can slow your pace down to fully enjoy what the author is trying to share with you. I very much enjoyed this book. I can't explain why some books grab my attention better than others. Maybe it's the way the author writes. Maybe it's the story line or the content. Maybe it's a throw-away phrase on the backmatter that beckoned me. Or maybe it's all the above tightly woven into a complex novel that registers on a deeply emotional level. This isn't a book that should be read as quickly as possible. This is a deep, rich novel filled with nuggets of wisdom and truth that must be chewe I very much enjoyed this book. I can't explain why some books grab my attention better than others. Maybe it's the way the author writes. Maybe it's the story line or the content. Maybe it's a throw-away phrase on the backmatter that beckoned me. Or maybe it's all the above tightly woven into a complex novel that registers on a deeply emotional level. This isn't a book that should be read as quickly as possible. This is a deep, rich novel filled with nuggets of wisdom and truth that must be chewed on and thought about. Applied to our own lives. There is so much, so many lessons in this story, it's hard for me to put it all into one single review. This is a read-again, think-again type of novel. One that helps put the past into perspective and allows ourselves to reach out to God and ask for the forgiveness He so willingly offers. Especially when it's so difficult for us to forgive ourselves for our own heinous past. Have you ever heard someone say, "If I'd do anything in my life over, it'd be..." and out pours some past regrets of something they did or didn't do? Now, what if you had pulled a senseless prank on someone and had to live with the awful consequences for the rest of your life? Would you allow your regrets to consume you and change your future? Or would you know that choice rather than fate governs our lives and those actions are the ones that will define us for what we would become? Everyone makes mistakes. Everyone stumbles and falls. Bad things happen to good people. We all must live with the consequences of our actions; whether good or bad. Such is the case with Jake and Kate Barnett and Taylor Hathcock. I've read my fair share of scary books, but I am convinced the scariest antagonist of a novel is one who is more than insane (if that's possible) and believes all the evil acts he/she does is God's will and is the right thing. The ones who look like us but who have been pushed or bullied so much and treated so badly that they break into a million scattered, hurting pieces that can only hurt in retaliation. The pitiful ones. The saddest ones who make each of us stop and remember all the terrible things we said or did as kids to others who were a little different. "There is none good. There is only grace. Mercy and forgiveness." <~ No truer words were ever spoken. Billy Coffey was new to me when I read When Mockingbirds Sing last year. I had questions at the end of it, and hoped they would be answered in his book which, I presumed, would be a sequel. It seems, however, that Coffey doesn’t write his Mattingly books in chronological order. An author’s note at the start of The Devil Walks in Mattingly states that it is set four years BEFORE the events in When Mockingbirds Sing. So, if you were hoping to read more about Leah and Allie and the town’s recovery Billy Coffey was new to me when I read When Mockingbirds Sing last year. I had questions at the end of it, and hoped they would be answered in his book which, I presumed, would be a sequel. It seems, however, that Coffey doesn’t write his Mattingly books in chronological order. An author’s note at the start of The Devil Walks in Mattingly states that it is set four years BEFORE the events in When Mockingbirds Sing. So, if you were hoping to read more about Leah and Allie and the town’s recovery after the major event in that book – as I was – you’ll be disappointed. I think the events in The Devil Walks in Mattingly were mentioned in passing in When Mockingbirds Sing, but I was too focused on Leah’s story. I would have loved to have loved this book. It’s not that I’m not a fan of novels about the ‘thin spaces.’ I am. There are definitely things in this world that cannot be rationally explained. I was fascinated by what exists in Happy Hollow, and I want to know more about it. There’s no doubt that Coffey has a poetic way with words. The descriptions of the Hollow and what lies within it are powerful and emphasize the mystery of it. Unfortunately, I couldn’t connect with the characters. I had difficulty liking Jake, the main character and the only one to be written in the first person, and I think this was due to his attitude towards his job. I also didn’t get the actions of the townsfolk, who each seemed to believe they were responsible for bringing the devil to their town. Could they be that naïve to think that they were responsible for an unknown person committing a horrific murder? The only person I could understand was the teenager, Lucy. Lucy is lost, lonely and looking for something. Her entanglement with the mad man in the Hollow reminded me of the girls lured by Charles Manson. I hope we’ve not seen the last of her. Oh, and the sequel to Mockingbirds is coming. In the Heart of the Dark Wood will be out in November and picks up where When Mockingbirds Sing left off. Despite my indifference to The Devil Walks in Mattingly, I am looking forward to this release and do plan on reading it. Hopefully, I’ll get some of the answers I’m looking for. Thank you to Thomas Nelson and Litfuse for my complimentary copy of The Devil Walks in Mattingly, which I received in exchange for an honest review. Haunting tale of how three people in a small Virginia town live with the sins of their shared past. Coffey's descriptions are so thought-provoking and colorful. An answer from one of the main characters to the other's question asking if he's a good man is quite simple yet deep - "There's none good, there's only grace and hard trying." The title gave me the feeling that this would be one of those books you only read with someone around. I love scary stories but for some reason the cover of the book kind of gave me chills for some reason. This was definitely one I had to read. I read that all of the author's stories are written with Mattingly, Virginia as the setting. So that's where this book begins. Mattingly on the surface appears to be a quiet, small town where nothing exciting happens. The author takes you back 20 years when Philip McBride, a teenager died. Now three citizens of Mattingly go about their daily lives but they have always been haunted by that day. The three know for a fact that Philip's death was not a suicide but a murder. Jake Barnett and his wife do good deeds, hoping that will make the shame of Philip's death better. The guilt is eating them up. One of the other three, Taylor Hathcock who became a recluse in the mountains, in his insane thinking believes it's time to bring the truth out. The three can't come close to living a normal life. It has affected everyone they are close to. The three have nightmares, they see things that aren't there. Will they bring the truth forth? The author kept me turning the pages as fast as I could. I never felt like putting the book down. The author's writing is almost poetic. He uses a mix of first and third persons views. His writing is so grounded. He doesn't use a bunch of fancy words, bogging the reader down. Just plain Virginia talk. The writing, I found to be so smooth, not choppy. I just c couldn't get enough or read fast enough. What a read! The first chapter is titled THE END. How intriguing. What will happen to the three? Will they find redemption or will Philip continue to haunt them in Mattingly? I would recommend this book to everyone. A good haunting tale of death coming back to haunt the guilty. I was given a complimentary copy of THE DEVIL WALKS IN MATTINGLY by Billy Coffey from Litfuse Publicity Group for my honest view. No other compensation took place. Billy and his wife, Joanne, live with their two children in the foothills of Virginia's Blue Ridge Mountains. A product of his small-town locale, Billy counts as assets his rural authenticity, unwavering sense of purpose, and insatiable curiosity--all of which tend to make his front porch a comfortably crowded place.